Dutch public transport services are operated in the form of a concession. With a concession agreement granted by a public transport authority (there are 14 public transport authorities in the Netherlands), a public transport company has the sole right to transport passengers in a certain region or along a specific line. There are approximately 35 public transport concessions in the Netherlands. One of them is the North-Holland North concession that provides public bus services in the northern part of the Netherlands. It covers around 15 municipalities including Alkmaar, Den Helder, Heerhugowaard, and one of the Wadden Sea Islands, Texel. The North-Holland North concession is for 10 years. The current concession will end in July 2018. In March 2016, a tender for the new concession period (2018-2028) was started by the North Holland Province, the public transport authority under which the North-Holland North concession falls. For this, Fimotions assisted the tender team of Connexxion, the company currently operating this concession. 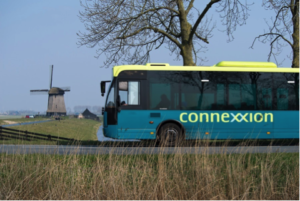 Connexxion is a large public transport company and today operates 18 concessions in the Netherlands. In May 2017, it was announced that the North Holland Province granted the new concession to Connexxion. Fimotions’ main task was to develop a Sustainability Plan and Transition to Zero Emission. This plan describes the objectives and measures needed to reduce CO2 emissions and air pollutants per passenger kilometer, mainly by deploying zero-emission buses. The public transport authority also required that starting from 2025 at least 50% of the bus fleet in the new concession must be zero-emission. Furthermore, the sustainability plan elaborates the implementation phases for the deployment of the zero-emission buses, how to guarantee a successful implementation, and mitigating measures. Last but not least, the plan also outlines other sustainability measures, such as noise reduction and circular economy.